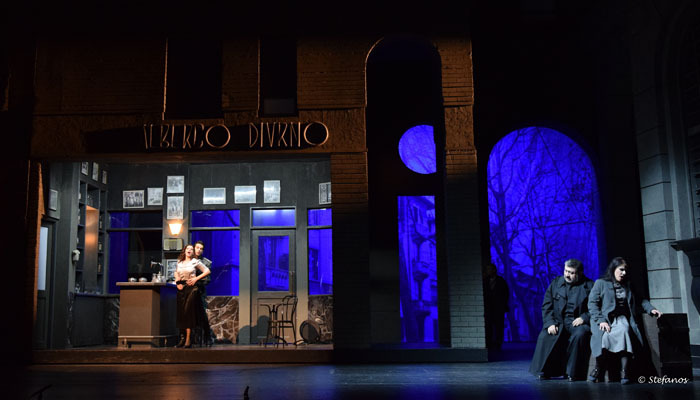 For it’s first installment of the participation of the Greek National Opera at the Athens Megaron (it will be followed in the new year with Verdi’s “Macbeth”), yet another Verdi opera was opted for, the revival of Nikos Petropoulos’s production of “Rigoletto”. 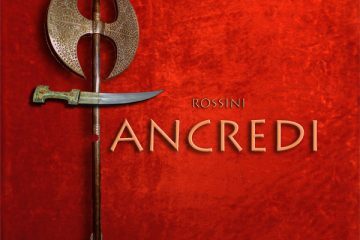 This is the second “film noir” opera after the very successful black and white “Tosca” a few years ago. The new revival was moved from the cramped stage of the GNO to the large and spacious stage of the Athens Megaron, where it breathed more freely. The sets looked more impressive and real, and the Chorus had ample space to move around the complicated sets without bumping to each other. Unfortunately a series of unforeseen events marred the first night. The idea was that during the short overture a film with the names of the entire cast was projected onto a screen, as if we were watching a film. However a technical problem occurred, the curtain decided to participate into the action refusing to fully open ,cutting thus in half the view of the stage. The performance stopped a few minutes after , and the audience was whisked out into an early fifteen minutes interval so that the problem would be fixed. To no avail… The next performances continued without the projection, and some of them I was told, without surtitles,something that defeated the whole purpose of the production. The cast had no less than three Gildas and three Dukes , since Mario Zeffiri did not appear at the premiere. 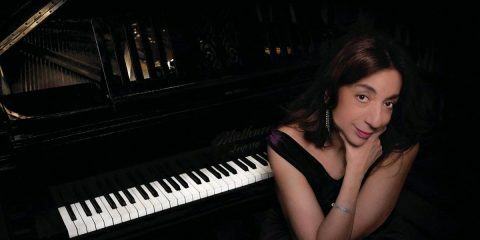 Irini Karayianni is an accomplished singer with easy coloraturas, and she sung the role with determination and expression with clear high notes. 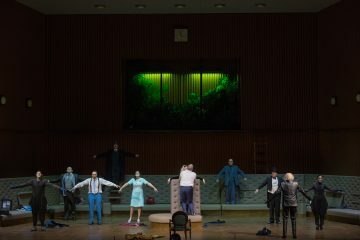 The surprise of this production came with the appearance of Christina Poulitsi, a young soprano with an exceptional voice. Great ease at the high registers, and a strong rounded voice, she was a joy to listen to. She has great potential, and one hopes that she will use her voice wisely in the future, a name to keep in one’s mind destined for a great career. I was less than happy with the two Dukes I heard (6th and 15th/12), especially with the last minute addition of the young Rame Lahai from Kossovo, a very handsome man, with a sweet voice that unfortunately did not carry well to the auditorium, it seems to me that his voice is better suited for the moment at last, for Mozart and Baroque operas. I enjoyed the Sparafucile of D.Kavrakos , but the interpretation of the role by P.Magoulas was exceptional. His voice is deep, rounded and well projected, and his physique helped him to portray an attractive but dangerous person. E.Voudouraki was a an excellent Maddalena, with a nice mezzo voice. 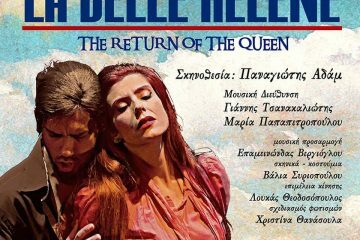 One should also mention the second but so important roles of Giovanna (both A.Matheoudaki and M.Vlachopoulou were in great voice, each one portraying the character in their own way), and finally the imposing Monterone of D.Kassioumis, with a firm strong voice, and P.Salatas, who I heard for the first time. Finally the Chorus of the G.N.O under the always inspired direction of A.Georgakatos. The G.N.O Orchestra was under the firm hand of L.Karytinos who is has a great affinity with Verdi,. His interpretation revealed attention to details coupled with his usual forceful energy. 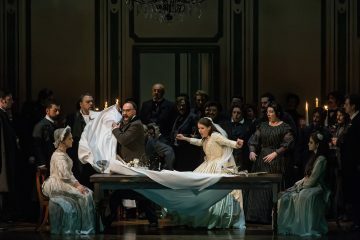 In general terms this production showed that the Greek National Opera, is well on its way to become an international House, something that is due to the efforts of M.Mihailidis and above all to the many talented people behind the scenes who always prove more than able to tackle any challenge presented. I believe that if the G.N.O opens up its repertoire, and theOrchestra is groomed into familiarize itself with Symphonic music, (something of paramount importance if the House decides to present operas by Wagner and R.Strauss), especially now that it will move to its new premises in Phaliron.